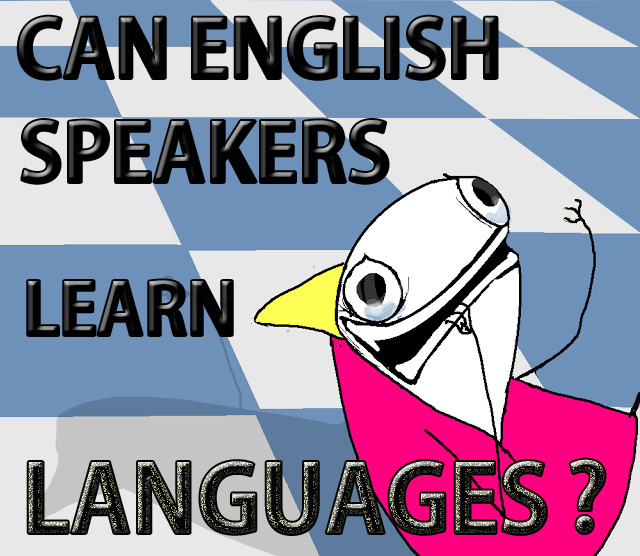 Can English Speakers Learn Languages? Today we have a guest post and an interview featuring Steve Kaufmann, a well known polyglot and former Canadian diplomat with amazing skills in 14 languages. What prevents more English speakers from learning another language? Many people whom I meet want to learn another language, or at least they say that they would like to be able to speak another language. Very often this second language is Spanish, since many people travel to Spain, Mexico or other Spanish-speaking countries on holiday. Yet very few of these people who say they want to learn Spanish, or some other language, ever achieve reasonable fluency in that language. This is not because they don’t spend time and money. Huge amounts of money are spent on language learning materials, as well as on language schools, whether brick and mortar or online. Most of that investment of money and time gives a very poor return. Most English speakers don’t carry on to achieve reasonable fluency. Why Are English Speakers Struggling to Learn Languages? In countries like Sweden, Holland, and some other European countries, a much larger number of people achieve fluency in another language, usually English. What is the difference? Can English speakers learn something from these Europeans? It is not just a small number of dedicated language learners in these countries who learn to speak English well, a majority do. This is not the case amongst English speakers. When it comes to dedicated language learners, those who often study multiple languages or difficult languages, English speakers are just as capable as their European counterparts. There is no inherent difference in language learning talent between these countries. But in the general public successful language learners are hard to find amongst English speakers, and speaking a foreign language is often seen as a unique skill. In many European countries it is simply taken for granted. Even Finns, who speak a language that is not related to English, are more successful in learning English than English speakers in their attempts to learn Spanish. This is despite the fact that English speakers have a significant advantage in trying to learn Spanish, when compared to Finns trying to learn English. Spanish shares about 50% of its vocabulary with English. Both languages have a high percentage of words of Latin origin, probably over 60% in English and 90% in Spanish. Both languages are part of the Indo-European group of languages, whereas Finnish is not. So why do Finns learn English, while English speakers don’t learn Spanish? The reason is motivation, pure and simple. Finns know that without English they will be unable to communicate with people in other countries and their employment opportunities will be reduced. English is viewed as the international language, not only for business, but also because of the pervasiveness of English-speaking popular culture. We could add the dominant position of English as a language of science and academia. So where does this leave the English-speaking learner of Spanish, or for that matter French, German, Russian, or even Asian languages? Is it possible for the English-speaking language learner to drum up the same degree of motivation as inspires the Finn, the Swede and the Dutchman? We know that the inherent talent for languages is the same. This is a very important question. More than the learning method, or the quality of the language teacher, or the effectiveness of the language classroom, it is the motivation of the learner that will determine language learning success. The importance of English is an objective fact, but it cannot of itself make people learn the language. The motivation comes from within. Each European learner of English has to decide that English is important for him or her. The English-speaking learner of foreign languages needs to decide for his or her own reasons that learning another language, say Spanish, is as important to him or her as learning English is to the European. Can this be done? I am a passionate language learner. To me the answer is obvious. When I start learning a language, I soon discover a new world of interesting and fascinating language content to read and listen to. Stories, people talking to each other, history, politics and more. The internet brings this content to my fingertips. In the languages that I have undertaken in the last few years, Portuguese, Russian, Korean, Czech, Ukrainian, and Romanian, I have discovered wonderful websites full of fascinating language content. After an initial period of a few months of listening and reading, and using LingQ, I start to feel the confidence to start speaking. As I start speaking, more and more of the words that I have learned start to come out. I make new friends. While I struggle at first, I don’t worry about it. I know from experience that if I persevere I will be able to interact more and more comfortably with people of another language group. I occasionally glance at rules of grammar, but I don’t get bogged down in the nuts and bolts of language learning. I know that this would only dampen my enthusiasm for the new language. The more I interact with the language, the more my enthusiasm and motivation grows. My question is, am I unique? I don’t think so. It is just that I have done it before, and now that I can succeed, as long as I stay the course. The appetite grows with eating, or “l’appétit vient en mangeant” as the French say. Give it a try. Steve Kaufmann is a graduate of L’Institut d’Etudes Politiques in Paris, France (1966) , and a former Canadian Diplomat. He is currently President of KP Wood Ltd, a company involved in the international wood products trade. Interview with Steve: Is it difficult to learn a language? A lot of people are afraid to learn a language because they have been told that it’s something that is just too difficult. So really, just how difficult is it to learn a foreign language in your opinion, and why? From your own experience, has language learning become considerably easier as you got to know yourself better as a learner? What is your opinion and experience of classroom-based language teaching, and do you think the way languages are taught in schools should be reformed? For example, do you think we’re making sufficient use of technology to facilitate Foreign Language Acquisition? Do you have any additional tips for language learners? Excelente post, Samuel!! 🙂 Y buena entrevista con Steve! Sans doute, Steve est une grande inspiration pour tous nous les polyglottes!! Et en ce qui concerne les anglophones, je parlerais espagnol avec eux s’ils veulent le practiquer. Je leur aiderais inclusivement!! Enfin, il faut supprimer les limites pour les anglophones parce que comme presque la moitié du monde parle anglais, on les parle automatiquement en anglais, sans qu’ils practiquent. Enfin, j’ai aimé comme toujours tes posts et les articles!! Oui tu as raison Julio, beaucoup de personnes parlent automatiquement en anglais aux anglophones, alors naturellement il est vrai qu’il puisse être un peu difficile pour eux de pratiquer une langue étrangère même lorsque qu’ils voyagent. Great article Steve! I agree learning a language is like any other skill. It requires determination and hard work. A lot of English native speakers will be truly impressed if a person can speak an ‘exotic’ Asian language. But it’s as hard for an English speaker to learn Chinese as it is a Chinese speaker to learn English. However, we rarely give them as much credit. I don’t think its just personal motivation either. Even though their methods may not always be the most effective there is a greater social and educational pressure to learn English in most Asian countries than there is a pressure to learn another language in English speaking countries. When I was at school my personal motivation to learn languages was low, yet there was little expectation or pressure to learn also. A second language class was more to learn about another country’s culture than to actually be able to speak its language. I just wish I had found my fire for language learning earlier! I think the reason a smaller % of native English speakers learn to speak foreign languages is — they often don’t need to learn a foreign language to communicate, ; and they often don’t see how knowing a foreign language would be useful or practical. * Vs. someone from Finland (for example), wouldn’t find many people in other countries who speak Finnish, so if they want to communicate, they are forced to learn a foreign language. ANOTHER REASON: U.S.A. is so huge, and isolated from rest of world (UK, and Australia/NZ, are also isolated by the ocean). But back to U.S.: it is such a large nation, most people don’t encounter others who don’t speak English, and don’t see foreign languages demonstrated in their daily lives. So, the importance or usefulness of learning another language may seem less evident. They don’t see how they would really use it in daily life. * But in Europe (for example), many countries are smaller, and have long borders (or are completely surrounded by borders) with other countries where people speak different languages. Europeans see people of other nationalities every day — including tons of tourists in many places. On TV they may see programs in other languages (or at least dubbed). They are reminded all the time of all the different languages spoken nearby. This makes it seem more useful and practical, and they can see how they could use a foreign language in daily life.